Anti-Aging Face Cream For Men 50 ml / 1.7 fl. oz. An effective Anti-Aging skin-care cream that responds to the needs of the most demanding men. - Action 1: instantly tones and smoothes the skin. The skin is smoothed and facial expressions revived creating an intense feeling of well being. - Action 2: tightens and restructures the tissues to fight against sagging: wrinkles and lines are softened for a younger looking skin. - Action 3: restores hydro-lipidic balance by improving hydration through regulating the production of sebum. The result: a matt and more comfortable skin throughout the whole day. A man’s skin is thicker than a woman’s. It contains more collagen making it harder and more resistant. Due to this phenomenon, men’s skin ages less quickly than woman’s. However, when wrinkles appear on the male skin, they transform quickly into deep wrinkles that need a more powerful treatment. 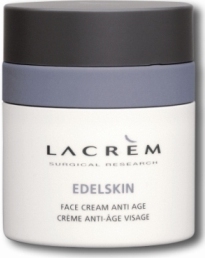 LACRÈM has perfected this product with high concentrations of active ingredients to fight against the deep wrinkles of a man’s skin. New, highly effective active ingredients have been combined to smooth and restructure the face. The results are visible in the 4 key areas of aging on a man’s face. (See diagram below). - Flex-zone complex: The synergetic action of polymers with purified vegetal extracts (ginger, white wormwood and cinnamon) soothe the skin after shaving and regulate the production of sebum. - Polylift®: bio-polymer forms an elastic film that smoothes and tightens the skin creating an effect similar to a face lift. - Matrixyl®: a peptide that increases the production of collagen and GAG to visibly diminish the amount of deep wrinkles. -Toniskin®: a biotechnological extract that stimulates the production of type IV and VII collagen in order to reshape the face’s contour and fight against sagging. Apply daily to the face and the neck with light massage movements until the entire product is absorbed. This product can also be used after the Edelskin Energizing Face Balm.